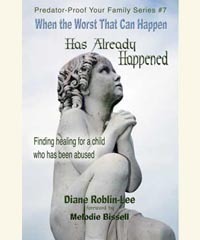 What do you do when your life is suddenly shattered and your family has been broken from issues of child sexual abuse? 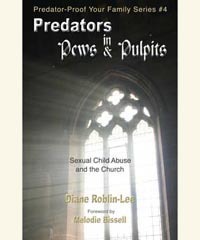 Rather than allow devastation to have the final word following her husband's confession to child sexual abuse, Diane has broken the silence in which predators hide. 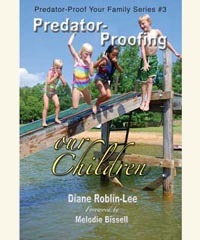 Throughout her nine-booklet series, Predator-Proof Your Family, she shares her personal experience and extensive research in the field of child sexual abuse. 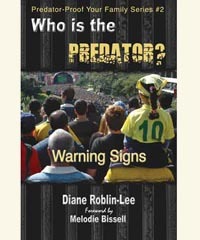 Her book, Predators Live Among Us is available through Castle Quay Publishing. Her passion for the strengthening of families, protection of children, prevention of abuse and restoration for broken people, is presently channeled through her work with Plan to Protect® and her association with Kelita and the Restorative Justice community. She has turned her brokenness into information and protection for other children and other families. 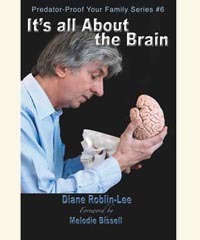 Click on the individual book covers to purchase from Amazon. As you scroll down the page, you will find information and contact links to assist families to prevent the devastation of abuse or assist in its healing. Can parents trust your organization to protect their children? Will insurance companies insure you? At Plan to Protect®, our priority is abuse prevention and vulnerable sector protection. By equipping your organization with effective and customized policies, procedures, and training, our goal is to make your community a safe one. One of the most valued services Plan to Protect® offers is the assistance we provide organizations to help them meet requirements of insurance companies in order to qualify for abuse coverage. Implementation of Plan to Protect® helps organizations and the individuals they serve stay protected. Today, Plan to Protect® has helped to create safe environments for thousands of vulnerable sector individuals from over 7,500 organizations. In addition, our excellent training modules provide our members with up-to-date, specialized, and ongoing support. It doesn’t matter how large or small your organization is. If you deal with the vulnerable sector, it is absolutely imperative to have a solid plan in place to protect the people around you. Plan to Protect® is a manual designed to assist you in protecting your children, youth, church/organization and personnel. The manual includes policies on: recruitment and screening, implementation and training, children and youth program procedures, and reporting and responding to suspicions and allegations of abuse. An extensive appendices includes templates of forms, signs, policies, checklists and more. Watching Kelita perform with beauty, confidence and outstanding gifting, one would never imagine that her childhood was fraught with sexual abuse and trauma. Rather than allowing her pain to solidify into bitterness, she allowed her soul to take wings with the desire to sing and perform. Deeply wounded after her father’s suicide, she wrote her first song when she was 11, instinctively acknowledging her very special gift from God. Then at age 14, shortly before her mother’s death from cancer, she solidified her commitment to her faith. Two years later her half brother, the perpetrator of her childhood sexual abuse, died from a heroin overdose. At 18, she finally escaped from her wicked stepfather. For years, Kelita hid behind the masks that veiled the deep dark secrets of her life, riddled by shame, guilt, fear and self doubt. Finally, through her relationship with Jesus, she was able to release the dark secrets and experience total healing. Now, through her music and speaking, Kelita encourages and helps others to release their dark secrets and free themselves from the darkness of their lives. To book Kelita for your event, large or small, click here. 3) Who is responsible to begin to make things as right as possible. These are not simple questions, and the answers and solutions are not always easy or quick. Unlike our criminal justice system which is driven by what laws have been broken, who will be charged and what punishment will be handed out, restorative justice is driven by what relationships have been broken and the needs of all those who have been impacted by the action that has occurred. This includes not only the offender and the direct victim, but also includes other members of the community, including family and friends who may have been impacted in some way. Restorative Justice asks that harms be acknowledged, damages repaired, dignity established and offers hope of integration for all those who have experienced harm and alienation. Restorative justice is not a replacement of our justice system, although restorative approaches have been used as part of our criminal justice process. 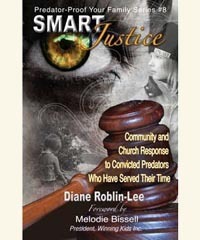 Restorative Justice is not about forgiveness, although that may occur. Restorative justice is about addressing needs and working along side individuals and communities so that they are not isolated and alone. Restorative justice is about offender accountability and asks that the individual who has committed the crime begin to repair the harm that has been done. We know that there are many instances where the repairing of harm on an even basis can not be done. When a life is taken, or innocence is destroyed, there is never an equal repayment. However, there are other ways that can be initiated that will enable a person to begin to give back in ways that can benefit the larger community and ensure the safety of those who have experienced victimization. To speak with Eileen, call 905-464-3940. Everything begins with the family - the basic institution of society. As a general rule, strong marriages and strong families build strong individuals who are better equipped to withstand the storms of life. When a developing child absorbs healthy values, he or she is less likely to develop deviant behaviours, sparing countless people the results that would overwise have ensued. Heart to Heart Marriage and Family Ministries is committed to the mission of training marriage trainers and providing marriage education classes and curriculum across Canada. Their vision is to see churches and communities respond to the challenge to provide the resources needed to strengthen and restore marriages and build a strong foundation for all newly wed couples. They believe marriage education is essential for the church community to deal with the pain and suffering that comes from broken marriages and families by providing the care, compassion, understanding and grace to help marriages move forward. For family support, speaking engagements and family and marriage training, contact Ron & Ann Mainse at the Heart to Heart Marriage and Family Ministries.